Your website is the most important asset for marketing your business. 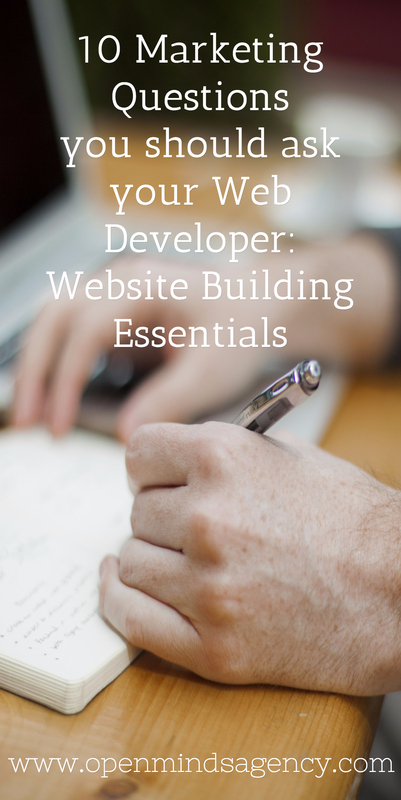 Whether you are redesigning an existing website or building a new website, asking the right set of marketing questions to a web developer can help. A web development task usually comes under the technical department. Because of this, there is a high probability of the marketing aspects of a website being overlooked or ignored. A good backend technology & framework is essential for a website, but the marketing aspects are equally important. Your business website should be much more than a nice looking, well-programmed application, you want it to produce results. A good website is one that is optimized to achieve marketing and business goals. That can happen only when it is built with insights on usability, user experience (UX) and user interface (UI). When you are building or redesigning your website, it helps to imagine that you are building a new office space. This ‘online office’ is where your business will operate on the internet. Think of each website visitor as a prospect who walks into that ‘online office’ building. By clicking your website link, they choose to enter your office and look around. And this could happen anytime, day or night, 24 X 7, with or without your knowledge & intervention! They will choose which room they go into, which cabin they inspect and what information they like to know, all without your help. They have complete freedom to do what they want, once they get in to your ‘online office’ building. And at the end of this visit, your aim should be to make the visitors walk out of your office fully satisfied, with a high probability of coming back. Even better, make them choose to leave their business card behind – in the form of an email subscription! To achieve this, here is a list of essential questions that you should ask your web developer before building or redesigning your business website. 1. Is the website mobile-optimized? On February 26, 2015 search giant Google announced that they were making changes to their algorithm. This is to help people find mobile-friendly websites when they search for something on Google. It means that your website being mobile-optimized (or not), would have a direct impact on how your site shows up on search results. This is not a surprising announcement considering the fact that the mobile user-base is increasing globally at an exponential rate. Many of your prospects will access your website using their mobile devices. So make sure that your website looks good to them on all mobile devices, tablets and phones. 2. Is there a Blog facility in the website? Blogging helps you build traffic and trust. Blogs are a good way to add value to your customers, by helping them learn more about your area of expertise. The more you empower people by teaching them, the more they will choose to stay connected with you and eventually choose to transact with you. Blogging has helped us grow as a startup agency. The fact that you are reading this blog post is a proof that blogging works! We are passionate about helping small businesses, startups and non-profits in digital marketing. Using blog posts we are able to help our audience and build trust by giving useful, actionable information on our industry and our area of work. If it works for us & for millions of businesses, it can work for you too. Make sure your web developer understands the importance of having a blog as an in-built & not a stand alone application. A stand-alone blog will not only split the traffic, but also reduce usability & your ability to connect with customers. 3. Can users share the website content easily? When you share useful information on your blog, people are likely to share it with their social media and other networks. Social media sharing tools and RSS feeds will help them do it. Your website should be built with these sharing options. One option is to have a floating share-bar on the website (see example below). But make sure that the sharing option is optimized for your mobile users too. For example, in our website, we have a couple of extra buttons for mobile users (ability to share the link on Whatsapp or SMS). These buttons do not appear in the desktop version of our website. Depending on the development platform, the developer should be able to implement these for you. 4. Is there an easy option for the user to subscribe to the email list? When a visitor subscribes to your email list, they are giving you permission to contact them. This is precious! As a business, it is important for you to collect and grow your email list. Your website must have this feature built in. As you can see in the examples below, there are many ways to do this. You could also implement an advanced option like forms that appear just when a user is about to click the close (x) button of the browser. These are called ‘user-intent’ triggered pop-ups. At every single opportunity make sure you have the option to capture emails (of course, do it smartly without annoying your visitors). 5. Does the website have a facility for lead-magnet-give-aways? In the examples above, you can see that we have a given an eBook download option for anyone who signs up. This is a lead-magnet-give-away. The idea is to give something (of real value) that will benefit your visitor and in turn ask them to share their email id with you. This give-away is of mutual benefit and is a great way to build leads. Ask your developer to have a provision in your website for such lead magnets. While implementing, just ensure that you are adding real value to the visitor. It’s a good idea to listen to your customers, before deciding what to give away. We added this eBook download option on our site, because most of our prospects were concerned about social media measurement. 6. Is there a measurement and analytics tool setup? Measurement is the key to success. Each website is different. In our experience as an agency, we have found what works for one website need not work for another. So you should have the option to measure what works and what does not work. This will help you fine tune your website for optimum performance. Google Analytics is the best, it’s free and is easy to install. I would highly recommend it. There are other analytics tools in the market like Clicky, Kissmetrics, etc. that you could check out. 7. Is there an option to build landing pages? Landing pages are essential for a Marketing campaign’s effectiveness. A landing page is a webpage on your website created for a specific audience with a specific purpose in mind. They are not the general website pages with general information. These pages helps you focus your message for a specific segment and hence add more value to the visitor who lands up on these pages. Every campaign you run should ideally have a landing page associated with it. Your website should have the option to build as many landing pages as you need for your campaigns. 8. How about internal site search option? Many people do not give importance to internal site search. But internal site search combined with your analytics can give you awesome insights on your website visitors’ behaviour. Tells you what business outcomes arise out of these site activities. Internal site search is valuable tool to have in your website. Ask your web developer to include this in the scope of work. 9 .Is there a facility to build call-to-action elements on all pages? Sometimes the answers to the most complex marketing problems lie in basic, good-old, time-tested sales practices. As Zig Ziglar says ‘always ask’ the customer to take action. Online behaviour is no different. Customers have the tendency to do what you ‘ask’ them to do. In your website, as visitors walk through your content, what actions are you going to ask them to take? If you do not ask them to take an action, they simply won’t. Plan your call-to-actions for each section of your website and ask your developer to give you provisions to build these elements into every possible page. 10. Is the website hosted on a scalable and stable hosting platform? After building an awesome website, the last thing you want your visitors to see is an error message or a blank page when they type your URL, because of site unavailability. You have spent time, effort and money to get that visitor to your website; now you need to make sure the site is available for them, when they need it. This depends on your choice of the hosting server. Make sure you choose a scalable and proven hosting solution. Here is an analysis of hosting service providers by PC Magazine. You could ask your web developers to recommend a hosting plan & provider based on their expertise. You could choose an internal, cloud-based, shared or dedicated hosting solution. Hope this information helps you develop a good website with robust marketing elements build into it. Wishing you success! Let us know if we can help you in your quest for a great marketing website for your business. Do leave your comments below. I appreciate it! Feel free to share this blog post and information with your social media followers using the share buttons.